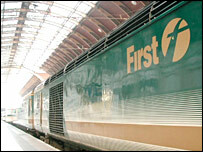 Rail bosses and repair firms are to face charges after a train came off the tracks at 120mph, three years ago. The First Great Western Express was carrying 450 people when it derailed near Southall, west London, in 2002. It remained upright and kept going for two miles, stopping just outside West Ealing station - no-one was hurt. Network Rail and Amey will face charges brought by the Health and Safety Executive (HSE) at City of London Magistrates' Court on 8 December. The HSE is bringing the prosecution under the Health and Safety at Work Act and alleges the companies jeopardised passengers' safety by not adequately installing or maintaining the railway line. The Swansea to London express derailed east of Southall station on 24 November 2002.